So I am super thankful for great online sites like QVC who offer super cute, stylish clothing and I never even need to leave my house to buy them! I recently received the super stylish Edge by Jen Rade Sleeveless Embellished Tank in Red. This sleeveless shell hits a note of rockstar chic with cool embellished detailing. 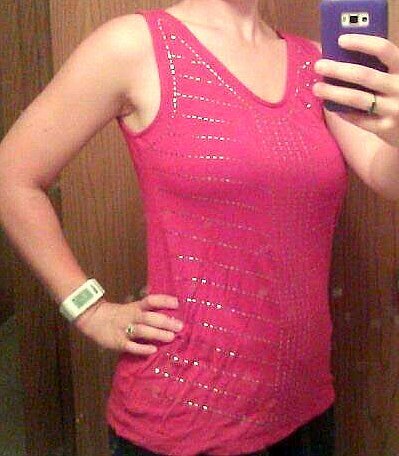 I love to wear this tank with leggings, capris or it would even look cute with shorts! It is super comfortable to wear and the material is so soft!! Plus, the embellishments let me shine and feel cute and young again! A few things to keep in mind when ordering and wearing: The sizing seems to run big. Maybe go with a size smaller than you normally wear. And make sure to follow the directions of hand washing and line drying only! It will shrink! Overall, I love this tank and it is my new favorite to wear at special occasions and everyday use because it is comfortable and cute and I love that I can feel both at the same time! Buy It: You can purchase the Edge by Jen Rade Sleeveless Embellished Tank for $29.84 (on clearance!) from QVC.com.